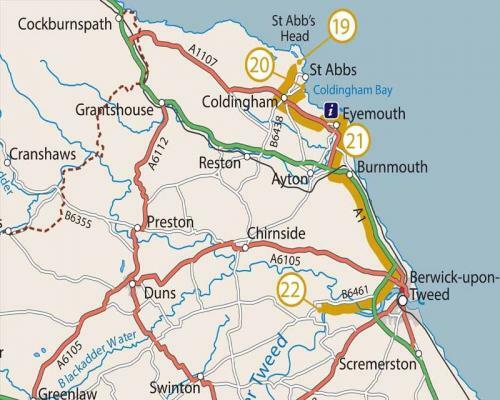 This route explores the spectacular Berwickshire coastline before heading inland for a last visit to the River Tweed. It’s an area with many hidden treasures including spectacular cliff-top walks, abundant sea bird colonies and beautiful beaches. Take in the mystery of an intriguing Benedictine priory or head directly to the coast for a bracing walk along the dramatic rocky cliffs. Discover the strange and beautiful creatures that live in submerged, rock-pool worlds, then experience what it was like to be a smuggler. Round off your day in the elegant surroundings of a country house with fine furniture and paintings, or take a leisurely stroll through the extensive grounds. In the centre of Coldingham, close to the junction of the A1107 and the B6438, Coldingham Priory is well worth a visit before heading for the coast. From there, continue along the B6438 for 1.1 miles/1.7 km following signs for the NNR and car park at Northfield Farm. You can walk from the reserve car park and visitor centre via St Abb’s and the coastal path to Coldingham Sands. If you prefer to drive, head back along the B6438 for 0.8 miles/1.3 km and turn left along a minor road to reach the beach-side car park (0.6 miles/1 km). Retrace your route back to Coldingham and turn left following the A1107. After 2.6 miles/4.2 km turn left to Eyemouth on the B6355. Park in one of town’s many parking areas and walk to the harbour. Here you’ll find the maritime museum on the western side and Gunsgreen House on opposite side. There are toilets and refreshments available at the harbour. Continue on the B6355 and turn left at a crossroads to rejoin the A1107. Follow it for 1.7 miles/2.6 km to the T-junction with the A1 where you turn left. Head southeast along the A1, crossing the border into England, for 5.6 miles/9 km to a roundabout. Turn right (2nd exit) onto the A1 Berwick-upon-Tweed bypass and after a further 1.5 miles/2.4 km turn right onto the B6461. Back in Scotland, Paxton House is signposted 2.6 miles/4.2 km from here, where you’ll find a tea room and toilets available. The craggy landscape of St Abb’s Head is a haven for birdwatchers, walkers and wildlife lovers. The dramatic cliffs provide spectacular vantage points from which to watch thousands of nesting seabirds, including guillemots, kittiwakes and razorbills. Enjoy the fresh air and spectacular scenery with a walk along the grassy cliff tops – there are a choice of waymarked routes from the car park. Learn more about the area’s flora and fauna, its history and culture, by visiting the St Abb’s Head Visitor Centre. Search the rock pools for anemones, watch hermit crabs battle over shells and see if you can spot a shrimp. This award-winning beach within Coldingham Bay is full of marine life and is part of the St Abbs and Eyemouth Voluntary Marine Reserve. The area is popular with surfers, body borders and walkers who come to enjoy the delights of this sandy bay and rocky shore. Coldingham is fringed by dunes and grassland that provide a habitat for a whole host of coastal species. The Eyemouth Maritime Centre is housed in what looks like an 18th century frigate set against the side of the harbour. Inside you’ll find a large collection of seafaring items that help to paint a picture of what life must have been like for a sailor in times gone by. Try your hand at tying knots, look inside a sailor’s bedroom, open up gun turrets and find out about Eyemouth’s notorious smuggling history. Built by local smuggler and merchant John Nisbet in the 1750s, Gunsgreen House gives a fascinating insight into the smugglers trade and is great fun for all the family. Uncover the secret hiding places built into the house, especially the Tea Chute, a unique survivor of the days when tea smuggling could make fortunes; dress up, do the Rat Trail, or even follow the Smuggling Trail and smuggle your own tea! Paxton House has been hailed as the finest example of neo-Palladian architecture in Scotland. It was designed by John Adam and completed in 1763. Inside the house you can view one of the best collections of Chippendale furniture in Britain alongside paintings by Reynolds, Raeburn and Wilkie. Outside, there are 80 acres (32 hectares) of woodland, riverside, park and gardens to explore along a variety of walks and nature trails. Look out for salmon, heron, cormorants, mute swans and sometimes even seals along the riverbanks. Open 1 April-2 November - House 11am-5pm (guided tours only), Grounds 10am-sunset.